Luis De Jesus Los Angeles is very pleased to announce that the Los Angeles County Museum of Art, Department of Prints and Drawings, has confirmed the acquisition of ten unique drawings by the Mexican-born artist HUGO CROSTHWAITE. 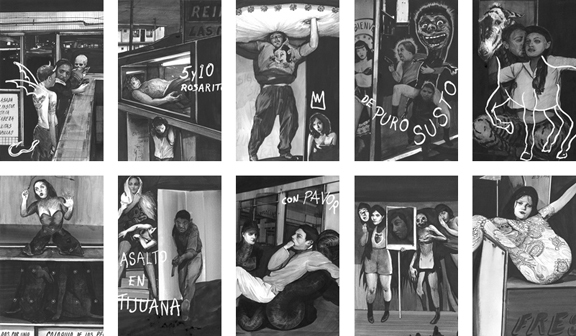 The suite of ten drawings are part of Crosthwaite's most recent body of work, entitled Tijuanerias, produced in 2011 and exhibited for the first time during his critically acclaimed solo exhibition at Luis De Jesus Los Angeles from April 14 through May 27, 2012. The drawings employ ink, ink wash, graphite and white out on Canson paper, and measure 8.5 x 5.5 inches each (21.5 x 13.9 cm). Crosthwaite's drawings will join LACMA's collection of approximately thirty thousand works from Western Europe and America, ranging from some of the earliest examples of printing, in the fifteenth century, to contemporary graphics - with a special emphasis on Southern California artworks since 1960. Allowing the act of drawing to organically dictate his compositions, Hugo Crosthwaite juxtaposes a wide range of textural and tonal ranges against spaces that alternate from dense and atmospheric to flat and graphic. Crosthwaite alternates between mythological subjects and contemporary ones, often combining the two. Francisco Goya, Eugene Delacroix, Gustave Doré, Jose Guadalupe Posada, and Arnold Böcklin are among the many artists that have inspired his work. The joining of abstraction with classically-rendered imagery creates a feeling of spontaneity and vagueness; each work becomes an enfoldment of personal vision in which reality, history, and mythology collide as he explores the complexities of human emotion and expression. This winter, Crosthwaite will participate in The Very Large Array, a survey of San Diego and Tijuana Artists in the collection of the Museum of Contemporary Art San Diego; Behold, America! at the San Diego Museum of Art; and The New World at the Wignall Museum of Contemporary Art, Chaffey College, Rancho Cucamonga, CA. Other recent exhibitions and projects include the epic mural Death March (10 by 25 feet), commissioned for Morbid Curiosity: The Richard Harris Collection (2012) at the Chicago Cultural Center; Brutal Beauty: Drawings by Hugo Crosthwaite, a solo exhibition in 2010 at the San Diego Museum of Art; TRANSactions: Contemporary Latin American and Latino Art, at the Museum of Contemporary Art San Diego; and El Grito/The Cry for Freedom, Univ. of Arkansas, Little Rock, AK. Hugo Crosthwaite was born 1974 in Tijuana and lives and works in Rosarito, Mexico and Brooklyn, NY. Crosthwaite graduated from San Diego State University in 1997 with a BA in Applied Arts. His works are in the permanent collections of the Miami Art Museum, FL; Museum of Contemporary Art San Diego, CA; Museum of Latin American Art, Long Beach, CA; Boca Raton Museum of Art, FL; and San Diego Museum of Art, CA, and many prominent private collections world wide. The Gallery will present new works by Hugo Crosthwaite at the PULSE Miami Contemporary Art Fair, Booth B102, from December 6 - 9, 2012. The fair is located at The Ice Palace, 1400 N. Miami Avenue, Miami, FL. For further information and images, please contact us at 310-838-6000, or email gallery@luisdejesus.com.